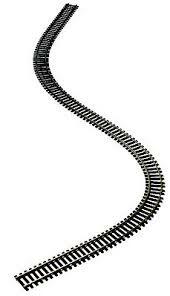 Flex track is track that comes in long pieces and can be curved any way you want. It is nice, but can be difficult to work with. Here are some tips and techniques to help you use flex track successfully. One problem with flex track is that when you lay it in a curve, it wants to straighten out again, so it holds a continuous side pressure against whatever is holding it down. This means you have to use a mounting system that holds it firmly in place, such as track nails. Another problem with flex track is that it is almost impossible to get a smooth curve across the joint between two pieces of flex track. The side pressure tends to make them straighten a tiny bit at the ends, which causes the track to have a small sudden direction change at the joint. The best way to avoid this is to make sure that a single piece of flex track goes all the way around the curve so that the joints are in the straight sections beyond the curve. But sometimes this is hard to do. In those cases, I have found that it works well to put one section of curved snap-track between the ends of the two pieces of flex track. 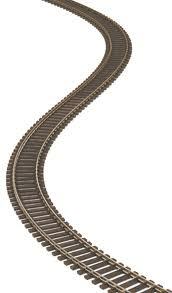 The snap-track base holds its rails in an exact curve. So when you connect flex track to snap-track, you can mount the snap-track such that the rail joiners apply side pressure to the end of the flex track enough to make the joint a smooth continuous curve. Another problem with flex track is that the ends do not have enough open rail for joiners. The ties with their small fingers that grip the rail go almost to the end of the rail. This is true both at the standard end of a piece of flex track and at a place where you have cut the track. My favorite way to deal with this is to use a hobby knife to trim the gripping fingers off the top of the last tie. If you are careful, you can hold the knife such that it will slice off the gripping fingers on one side of the rail, slide under the rail, and then cut of the gripping fingers on the other side of the rail. You may also want to trim just a tiny bit of the tie under the rail to make it easier for the joiner to slide between the tie and the rail, but this is not necessary. If you use flex track, you will sometimes have to cut it. In particular, after you run it around a curve, the inner rail sticks out much farther than the outer rail, so it must be cut off to make the rail ends even. It is possible to cut the rail with a small hobby saw, but I find that rather difficult. My favorite way to cut rail is with a cutoff wheel in a Dremel tool. I do not recommend cutting rail after the track is laid. I find that the cutoff wheel tends to make the rail vibrate as it is cutting, and sometimes this is enough to pull the rail out of the gripping fingers of some of the ties. So it works best to measure the rail and then cut it with it laid on a bench where you can hold it firmly. Note that you cannot grip the rail with your fingers near where you are cutting because it will get hot. You have to keep your fingers an inch or more back from where you are cutting. You can use a pliers to hold the track instead of your fingers, but be careful not to squeeze too hard, because the teeth on the jaws of the pliers like to bite little notches in the track. It is hard to hold the cutting wheel at an angle that produces a perfectly straight cut. So I usually let it cut at a bit of an angle and then after cutting I hold the end of the rail against the side of the cutoff wheel to smooth the end and make it straight. The cutoff wheel will leave little burrs on one side of the cut rail, so after you finish the cutoff, you will want to use a hobby knife to trim off the burrs. The burrs are easy to remove, so it only takes a light scrape with the edge of the knife to get them off. Unless you have very sharp eyesight, you will want to use a magnifying light to see the details of what you are doing when you are cutting and smoothing and trimming the end of a rail. When you lay a flex track curve, be careful not to accidentally make parts of the curve too tight. It is easy to make a curve that looks fine, but is not a smooth radius all the way around. If that happens, then some engines will derail on the tight parts of the curve. I sometimes check the curve with a compass. An ordinary school compass cannot open wide enough for this, so I use a rubber band to fasten a long pencil onto the short pencil of the compass. When you lay flex track, try to avoid having both a curve and change in grade in the same section. If you start an upgrade or downgrade in a curve, some engines will lift some of their wheels off the track at that place, and they may derail. So do your best to keep a curve flat. It is all right for the curve to do a smooth steady climb, but don’t start or end the climb in the curve. Do the start and end of the climb in straight areas of track. Note that steam engines are far more sensitive to these problems than diesels. So if you are sure you will never run a steam engine on your layout, then you don’t have to be quite as careful. But if you might like a steam engine someday, then be very careful to keep the curves as wide and smooth as you can, make the grade changes from flat to climb as long and gentle as you can, and never do a grade change in a curve. If you are interested in steam engines, then be careful to keep your curves at a relatively large radius. Most steam engines cannot handle a 9 3/4″ radius curve. Some small engines may be able to handle an 11″ curve, but some will derail regularly if you try to run them on a curve that tight. Since steam engines have a lot of wheels, it can be very frustrating to try to get one back on track after it derails, especially on a curve. And if it derailed because the curve was too tight, then it is hopeless. So, plan ahead. If you want to run big steam engines, then give them big curves. The ideal is a minimum of 19″ radius for big steam engines. This includes almost any steam engine with 4 or more driving wheels. One minor note is that flex track costs almost as much per foot as snap-track. So don’t expect to save a lot of money by using flex track. It is a little cheaper and it uses fewer rail joiners, so you may save a little. But that is not a big reason for using flex track. Flex track is really a great way to go for any layout of medium to large size. It allows you to make all kinds of custom arrangements of the track. If after reading this guide it sounds like something you can handle, I would encourage you to use it.